Ecocide: the fifth crime against peace? ucl.ac.uk/global-health/" target="_self">UCL Institute for Global Health, summarises the discussion at the symposium on ecocide on 19 January. "Every day 100 living species become extinct, 150,000 acres of tropical rainforest are destroyed, two million tons of toxic waste are dumped, and 100 million tons of greenhouse gases are released. Polly Higgins - an international environmental lawyer and activist voted by The Ecologist as one of the 'World's Top 10 Visionary Thinkers' - has submitted a proposal to the United Nations (UN) for 'ecocide' to become the fifth crime against peace. "This interdisciplinary symposium offered varying perspectives on how international law could be used to protect ecosystems and humans from the effects of ecocide, with key speaker Polly Higgins examining how international law could be used to protect ecosystems, and Dr Saladin Meckled-Garcia (UCL Institute for Human Rights) responding to her proposal. "Polly Higgins began her presentation with an overview of crimes against peace and the International Criminal Court. Crimes against peace are morality-driven laws, based on the sacredness of all life and the universal agreement to protect wellbeing. Although the first crime against peace (genocide) has been in place since 1948, the first case in the International Criminal Courts did not begin until 2006. "Polly Higgins defined ecocide as the extensive destruction, damage to or loss of ecosystems of a given territory (whether by human agency or other causes) to such an extent that the peaceful enjoyment of the inhabitants of that territory has been severely diminished. She argued that damage and destruction of ecosystems were causing resource depletion, which can lead to conflict, causing a cycle of further damage and destruction of ecosystems, citing the examples of Darfur and Iraq. 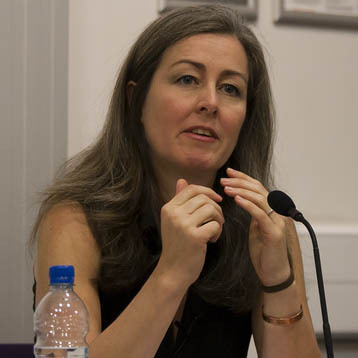 "Highlighting the responsibility principle, superior responsibility, strict liability, the UN, the 'sacred trust of civilization' and the divergent processes of property law and trusteeship law, Polly Higgins went on to debate the best legal methods for ensuring that ecocide is prevented or punishable. "The crime of ecocide should not be about closing down companies, she argued, but about ensuring that they are part of the solution. Two hundred years ago industry said that the end of the slave trade was uneconomic and would lead to loss of jobs, and there was public demand for slaves as they were a necessity. Industry proposed that reductions in use of slaves should be left to market forces and self regulation, and that industry itself would improve conditions and limit numbers. Legislation against the slave trade led to the industries involved developing hugely successful technological solutions in very short timescales. By legislating against ecocide, companies would develop new technologies and new ways of working far more rapidly than they would otherwise. "Dr Saladin Meckled-Garcia (Director of the UCL Institute for Human Rights) - with expertise in the ethical foundations of human rights and theories of international justice - emphasised his agreement with the urgency of the issue of damage to the planet and that action needs to be taken. However, he raised issues regarding whether ecocide would be accepted as an international crime against peace. He challenged the audience to consider what an international law on ecocide is trying to achieve; are we interested in the principles of international law, or achieving the aims of protecting ecosystems? Dr Meckled-Garcia examined the other legal solutions possible, suggesting a new convention may be simpler, but highlighted the current problems regarding agreement on the United Nations Framework Convention on Climate Change. "Audience members, including staff and students from across UCL, funders and members of the general public, then raised questions around the population-carrying capacity of Earth, how to reconcile long-term and short-term wellbeing for communities living in developing countries who rely on extraction of natural resources, the length of the transition period that developing countries should be given to move from fossil fuels to greener energy sources, and whether 'intent' causes a barrier for ecocide as the fifth crime against peace." The UCL Institute for Global Health initiates and enhances discipline- and department-specific programmes, research and teaching. It stimulates interdisciplinary discourse and intellectual debate, enabling the development of activity to make possible effective large-scale multidisciplinary approaches and interventions. Beyond UCL, it creates spaces for academic discourse in the public policy arena and international political processes; explores partnerships with other universities, government, industry, funding bodies, trusts and charities, UK and international agencies to support research, education, advocacy and public policy initiatives. The UCL Institute for Human Rights was established to bring the university's multidisciplinary expertise (for example in law, the humanities, and social and medical sciences) to bear on human rights. It aims to advance and disseminate knowledge on moral justification, legal interpretation and practical implementation of human rights. The institute also aims to equip students studying human rights with the knowledge and skills that will enable them to contribute to the human rights movement, through civil society, governmental institutions or legal practice.